The bacteria causing RMSF is passed to humans through the bite of an infected tick. The illness begins within about two weeks of such a bite. RMSF is the most widespread tick-borne illness in the United States, occurring in every state except Alaska and Hawaii. The states in the south-Atlantic region, (Delaware, Maryland, Washington DC, Virginia, West Virginia, North Carolina, South Carolina, Georgia, and Florida) have a great deal of tick activity during the spring and summer months, and the largest number of RMSF cases come from those states. About 5 percent of all ticks carry the causative bacteria. About 90 percent of all cases of RMSF occur between the months of April and September. Children under the age of 15 years have the majority of RMSF infections (about 66% of all infections). The peak incidence of RMSF occurs in five to nine year old children, with boys more likely to be infected than girls. A higher risk of infection seems to occur in individuals who spend time with dogs or who live near wooded or grassy areas. The bacterial culprit in RMSF is Rickettsia rickettsii . It causes no illness in the tick carrying it and can be passed on to the tick's offspring. When a tick attaches to a human, the bacteria are passed. The tick must be attached to the human for about six hours for this passage to occur. Although prompt tick removal will cut down on the chance of contracting RMSF, removal requires great care. If the tick's head and body are squashed during the course of removal, the bacteria can be inadvertently rubbed into the tiny bite wound. Symptoms of RMSF begin within two weeks of the bite of the infected tick. Symptoms usually begin suddenly, with high fever, chills, headache , severe weakness, and muscle pain . Pain in the large muscle of the calf is very common, and may be particularly severe. The patient may be somewhat confused and delirious. Without treatment, these symptoms may last two weeks or more. The rash of RMSF is quite characteristic. It usually begins on the fourth day of the illness and occurs in at least 90 percent of all patients with RMSF. It starts around the wrists and ankles, as flat pink marks (called macules). The rash spreads up the arms and legs, toward the chest, abdomen, and back. Unlike rashes that accompany various viral infections, the rash of RMSF does spread to the palms of the hands and the soles of the feet. Over a couple of days, the macules turn a reddish-purple color. In this new stage they are called petechiae, which are tiny areas of bleeding under the skin (pinpoint hemorrhages). Over the next several days, the individual petechiae may spread into each other, resulting in larger patches of hemorrhage. 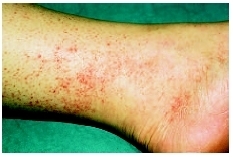 Rash caused by Rocky Mountain spotted fever. Diagnosis of RMSF is almost always made on the basis of the characteristic symptoms, coupled with either a known tick bite (noted by about 60 to 70 percent of patients) or exposure to an area known to harbor ticks. Complex tests exist to determine conclusively the diagnosis of RMSF, but these are performed in only a few laboratories. The results of these tests take so long to obtain that they are seldom used; delaying treatment is the main cause of death in patients with RMSF. It is essential to begin treatment absolutely as soon as RMSF is seriously suspected. Delaying treatment can result in death. Antibiotics are used to treat RMSF. The first choice is doxycycline; the second choice is chloramphenicol. If the patient is well enough, treatment by oral intake of medicine is perfectly effective. Sicker patients may need to be given the medication through a needle in the vein (intravenously). Penicillin and sulfa drugs are not suitable for treatment of RMSF, and their use may increase the death rate by delaying the use of truly effective medications. Very ill patients need to be hospitalized in an intensive care unit. Depending on the types of complications a particular patient experiences, a variety of treatments may be necessary, including intravenous fluids, blood transfusions, anti-seizure medications, kidney dialysis, and mechanical ventilation (a breathing machine). Prior to the regular use of antibiotics to treat RMSF, the death rate was about 25 percent. Although the death rate from RMSF has improved greatly with an understanding of the importance of early use of antibiotics, there is still a 5 percent death rate. This rate is believed to be due to delays in the administration of appropriate medications. Certain risk factors suggest a worse outcome in RMSF. Death rates are higher in males and increase as people age. It is considered a bad prognostic sign to develop symptoms of RMSF within only two to five days of a tick bite. When children have been playing outside, it is important to carefully examine them for ticks when they come indoors. Rapidly yet carefully removing any ticks may help prevent or decrease the injection of infection-causing material. Dogs that are kept as family pets should also be examined for the presence of ticks and treated regularly with tick-killing products. Macule —A flat, discolored area on the skin. Petechia —Plural, petechiae. A tiny purple or red spot on the skin resulting from a hemorrhage under the skin's surface. Dumler, J. Stephen. "Spotted Fever Group Rickettsioses." In Nelson Textbook of Pediatrics. Edited by Richard E. Behrman et al. Philadelphia: Saunders, 2004. Paddock, Christopher D., and James E. Childs. "Rickettsia rickettsii (Rocky Mountain Spotted Fever)." In Principles and Practice of Pediatric Infectious Diseases , 2nd ed. Edited by Sarah S. Long et al. St. Louis, MO: Elsevier, 2003.